USB IF POWER BRICK CERTIFIED(TID: 1022060): 65W Power Delivery USB Type C Wall Charger passed the rigorous test by USB compliance standard. No more worries about damaging your device, it’s fast and safe to provides you the best possible performance. 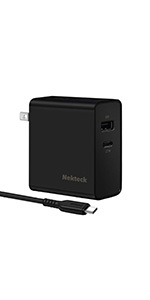 FAST CHARGE: With a 6ft USB C charging cable supports PD fast charge model with maximum power up to 65W, The USB-C port with Power Delivery 2.0 enables compatible devices to charge faster in a short time. SMART TECHNOLOGY: This Charger will intelligently identify your devices automatically and provide the fastest and most efficient output current (5V/3A, 9V/3A,12V/3A,15V/3A, 20V/3.25A). 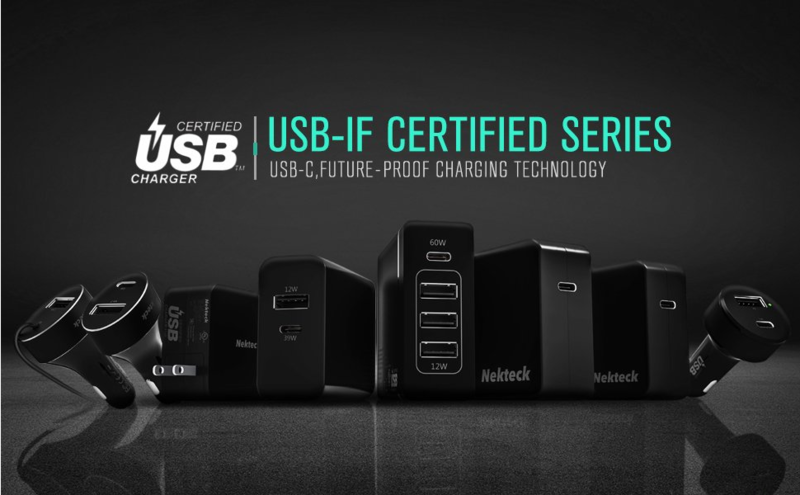 SAFETY GUARANTEE: USB-IF Certified, UL Listed, CE, FCC, RoHS, using the Highest Quality Components, build-in Safeguards Protected Against Over-Charging, Over-Currents, and Over-Heating. Dell XPS 13″ has the restriction for 3rd party charger, so there might be a warning message(at least 45W) when you plug in this charger. There might be NO “double chime” when it’s fast charging iPhone X, Xs, Xs Max due to different chipset/firmware. USB-C is the new future-proof connection standard delivering faster speeds, more efficient power delivery, low-profile fully reversible and user-friendly design with its 24 pin terminal. 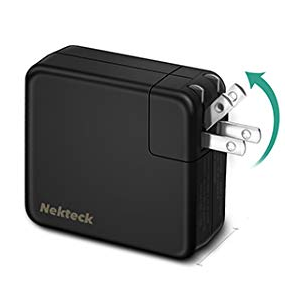 Compact design, foldable plug and 100-240 volt input are ideal for worldwide travel. Q: Why it’s not showing “fast/quick charging” on my smartphone, Like Samsung, Essential Phone? A: 1. Due to the different protocol, some devices use QC protocol like Samsung Galaxy S8, LG G5 may NOT show "fast charging"
Essential phone not only supports 9V rail, but also support 12V charging rail too(they advertise 9V3A only), so when the phone is charging at 12V rail, the charging current decrease (but overall charging voltage does NOT change, still 27W Max). the Essential phone maybe only monitors the current for charging speed showing “charging rapidly or slowly”, that’s why you will receive the “charging slowly” message sometimes, but the actual charging speed is faster, or at least, NOT slower. A : 1. It may take 10~20 seconds for the device and charge to negotiate before increase the charging voltage. for some smartphones like iPhone X, 8, the charging voltage will decrease to 5V when the percentage/ thermal reach certain level. Q: The charger does not charge full speed as advertised, why is that? A : 1. Check the maximum power your device can draw first, your device may have the limitation for the maximum power input. 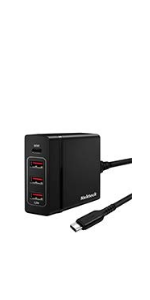 If you use USB-C Hub with PD, it's very likely the Hubs will consume a portion of power so the actual charging watts will be reduced on your end device. 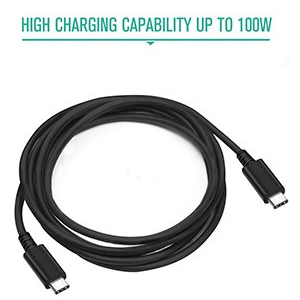 Only use the certified cable for optimal performance, if the charger itself is above 60W, make sure to use USB-C cable with 5A/100W capability. 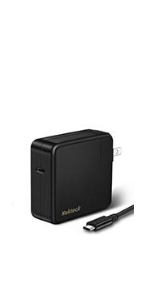 Q: Can I use the charger that output more power through USB-C than the maximum of the phone can draw? A: Yes, that's actually the beauty of the USB-C Power Delivery technology. USB IF POWER BRICK CERTIFIED(TID:1000080): First 45W Power Delivery USB Type C Car Charger passed rigorous test by USB compliance standard. No more worries about damaging your device, it’s fast and safe to provides you the best possible performance. The premium attached Type-C Integrated cable features a next-generation Type-C connector with a new design that is fully reversible. This allows you to plug in without fail, regardless of how you are holding and inserting the cable. Certified by RoHS, CE & FCC, USB-IF; High quality fire proof material & anti-oxidation aluminum pull tab;No radio loss in your car or effect to Bluetooth or Wi-Fi devices. USB IF POWER BRICK CERTIFIED(TID: 1200084): 90W Power Delivery USB Type C Wall Charger passed rigorous test by USB compliance standard. No more worries about damaging your device, it’s fast and safe to provides you the best possible performance. SMART TECHNOLOGY: This Charger will intelligently identify your devices automatically and provide the fastest and most efficient output current (5V/3A, 9V/3A,15V/3A, 20V/4.5A). USB IF POWER BRICK CERTIFIED(TID:1000081): First 45W Power Delivery USB Type C Car Charger passed rigorous test by USB compliance standard. No more worries about damaging your device, it’s fast and safe to provides you the best possible performance. 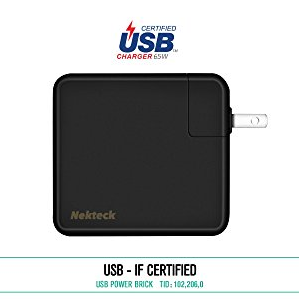 USB IF Certified Type-C 100W capable cable (TID: 210,000,323) features a next-generation Type-C connector with a new design that is fully reversible. 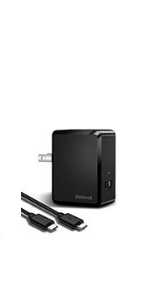 This allows you to plug in without fail, regardless of how you are holding and inserting the cable..
USB IF POWER BRICK CERTIFIED: 18W Power Delivery USB Type C Car Charger passed the rigorous test by USB compliance standard. No more worries about damaging your device, it’s fast and safe to provides you with the best possible performance. USB IF Certified Type-C 60W capable cable features a next-generation Type-C connector with a new design that is fully reversible. 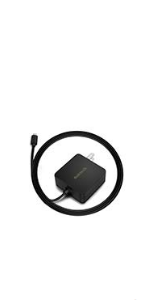 This allows you to plug in without fail, regardless of how you are holding and inserting the cable..
[Qualcomm Certified]Qualcomm Quick Charge 3.0 Technology: Charges compatible devices up to 75% faster. Get up to 8 hours use from just 15 minutes of charging! Compact Size: Easily fits in pocket. 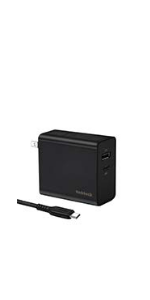 AC 100-240V input voltage for any international or European travel, WITH TWO 3.3 FT detachable USB A to C Cable and Micro USB Cable for easy transport. Full Compatibility: Charges all non-Quick Charge TM 3.0 phones and tablets at maxmimum speed (up to 5V/3A Max) with Auto Detect Technology. Safety Guarantee: Multiple built-in safeguards fully protect against over-current, overcharging and overheating for safe and fast charging. Blue LED indicates 5V output, green indicates 9V / 12V output. 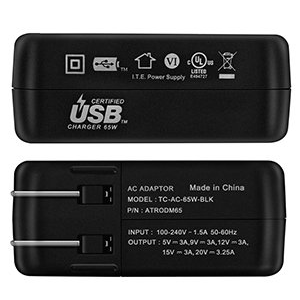 【USB Type-C Power Delivery】60W PD Charger Widely compatible with all USB C devices. 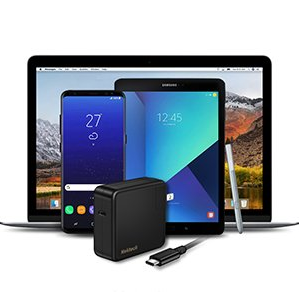 Support MacBook Pro, Nexus 5X/6P, Nintendo Switch, Pixel 2 XL , Lumia 950/950XL, Chromebook Pixeland other USB C devices.